A few heads were scratched at AOL Travelâ€™s recent story about about bed bugs.We werenâ€™t scratching from the bugs but from curiosity: Why would author Libby Zay do a piece on the nasty critters. A few heads were scratched at AOL Travel’s recent story about about bed bugs. Well, the reality is that bed bugs love places that travelers do, and that would be motels, hotels, planes, trains and buses. And bed bug infestation is increasing, it seems, because the decline in using pesticides has contributed to the scourge. So her story was really right on. 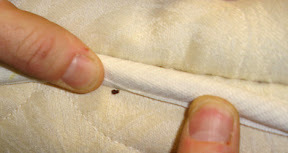 I remember traveling with a companion who obsessively checked for bed bugs in the hotel room, before we even checked in. Armed with a flash light, she’d ask to see the room we were assigned, pull back the mattress, inspect the lining, the bed frame, the box spring and even the furniture. The bed spread came under intense scrutiny as did the carpet. Any suspicions (droppings, dark stains, actual bugs) and we were out of there. Turns out she was doing all the right things, regardless of the stares from the insulted staff. No less an authority than the Ohio State University agrees. The site says one should thoroughly inspect any hotel or motel room with a flashlight, just as my traveling companion did. And it urges travelers to check their luggage too. But how do you inspect a hotel for bed bugs without totally insulting the staff and making a scene? I don’t know, but, hey, these nasty little things can ruin a vacation, and badly bitten victims can be driven to the brink of madness, so you have to do the right thing regardless..
Rick from Able Pest Control agrees with the intense hotel room inspection routine , and adds that when you return from your trip, you should wash everything in hot water, whether you’ve worn it or not; whether you encountered bed bugs or not, because you never know what’s lurking. * Take non-washables to the dry cleaner. • Call a professional if you suspect you’re hosting bed bugs. • Don’t try to treat the problem with pesticides. The good news is bed bugs have nothing to do with bad hygiene. But that’s a tough one to explain to friends and neighbors. Prev Article Prev Article How Safe Is Your Airline? Thanks for your article on beg bugs when traveling. Bed bugs are something that I've been very concerned about. I found some information on bed bugs pictures on the Bed Bugs Handbook. Interesting piece of news but I’d have liked some information about how to get rid of Bed Bug Bites if I find some.